If you do business in or around the Murphys area, we invite you to become a part of our very dynamic and active organization. The MBA meets most months on the first Thursday of the month at 8:30 am at The Murphys Historic Hotel to discuss upcoming events (we normally take January off), how to promote Murphys and other topics of interest to local business owners.. Everyone is welcome to join us at our membership meetings but you may want to verify meeting dates in advance as we do sometimes change them or skip a meeting. The board meets monthly at Gold Country Roasters. Anybody who wishes to present an idea or discuss a concern with the board is welcome to join us…just let us know so we can let you know exactly when we’ll be meeting. 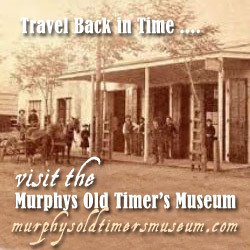 You can always contact us at info@visitmurphys.com. You may join our mailing list to be reminded of upcoming meetings and keep abreast of our activities by e-mailing us at info@visitmurphys.com. Opportunity to participate in any of our committees. Access and input to local issues affecting the business community. How Do I Join the MBA? CLICK HERE TO JOIN THE MBA TODAY ONLINE! Annual membership dues are $125 for the fiscal year beginning July 1 and ending June 30. Each additional business (if you own more than one) is $50. If you are joining us after February 1st but before July 1st, dues are pro-rated to $75; if you are joining us after April 15th and before July 1, your membership will begin immediately but your dues will be applied to the following year. If you are a local non-profit organization, the MBA is pleased to offer you a reciprocal membership at no cost. Click here for the online membership form and payment page! You may include your dues by check mailed to the address above, or pay securely online by credit card through PayPal.